I bought Replica at the beginning of last year but the thickness and the duality of the book prevented me from picking it up. But I finally did and even though it’s not bad, I will not read Ringer because I don’t care enough. I give Replica by Lauren Oliver three out of five hearts because I didn’t care enough and it was an okay read. I liked the idea of the story but Lauren Oliver is just not an author I like reading. 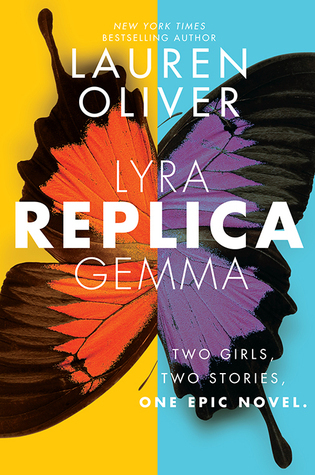 The book is a flip book, one half of it is the story from Lyra’s perspective and the other half of Gemma’s. Goodreads says you can read one after another or alternate the chapters. I read first Lyra’s and then Gemma’s for no apparent reason. It seems to be a promising story and the world is pretty well developed. The two different stories don’t work against each other and I loved the fact that I could just have only one pov in each story. Both girls were very different from each other and that was visible, which is great. But it also kept me from bonding with them because the characters didn’t bond with me. I also found that I kept wondering when the book was going to take me anywhere and it took forever for Lyra to meet Gemma and then they left! I do think Gemma’s reaction to Cassiopeia was a little too small for what it was. I think that if I would see someone who looks exactly like me I would scream and freak out instead of wonder. The concept is really interesting, but I didn’t care for the characters and where they are going, so I won’t be reading Ringer, the second part in this duology. This entry was posted in Book Review and tagged Adventure, Book Review, Dystopia, Lauren Oliver, Romance, Science-Fiction. Bookmark the permalink.